Watch an ad longer and all kinds of effectiveness measures should increase. That’s a pretty bankable assumption. But in a world where viewers are going to great lengths to avoid ads, just getting them seen and paid attention to have become huge challenges. For example, earlier this week a report from Adobe and PageFair estimated that publishers are now foregoing $22 billion per year due to increased use of ad blocking software. All of this has triggered a range of new video ad approaches to deliver improved monetization. One of them is “outstream” video ads, where the video ad plays outside of the video stream, instead running in a text article, newsfeed or slideshow, as opposed to instream (i.e. pre-roll, mid-roll or post-roll). I’ve been a fan of outstream ads for a while as I think they unlock lots of new premium inventory for publishers while balancing the viewer experience. To prove outstream’s effectiveness, Teads, a leading outstream technology provider, has released research it commissioned from Millward Brown Digital comparing the effectiveness of outstream vs. instream. The research tested Teads’ inRead outstream video ad in premium editorial content and Facebook’s outstream video ad running in a feed vs. YouTube’s TrueView ad running against UGC and a typical pre-roll running against professional video. 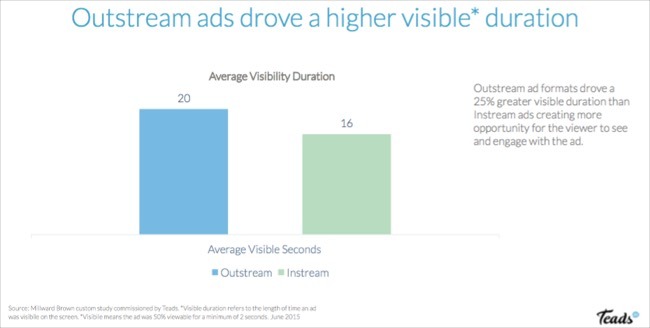 The research found that the outstream formats had a 25% higher average visibility duration (the amount of time the ad was visible on the screen), at 20 seconds, vs. instream’s 16 seconds. As a result of the longer view time, outstream ads drove higher effectiveness across a number of metrics. These included 25% higher lift vs. a control group in general awareness, plus improvements in unaided awareness, brand favorability, purchase intent and message association (all of the specific data and charts are in the report). All of it supports the case that outstream should be on advertisers’ radar when considering video ad formats. As viewers continue to seek ways to avoid ads, there’s no doubt we’ll see even more research on which formats are most effective at breaking through.